Last night in Chicago, Winnipeg Jets defenceman Adam Pardy got checked right through the glass at the United Center by Blackhawks winger Brandon Bollig. It was just like NHL ’94. What was not just like NHL ’94 was what happened afterward. 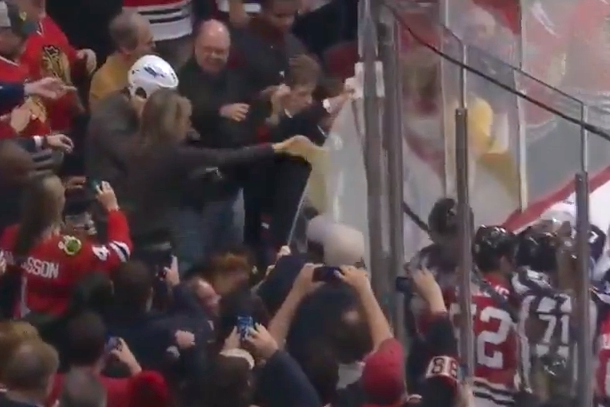 While Pardy was trying to help hold the glass off of the fans in the front row—while simultaneously trying to defend himself in the scrum surrounding him on the ice—a seemingly intoxicated Blackhawks fan reached down and ripped the dude’s helmet right off his head. Then he put it on. That was the funny part. 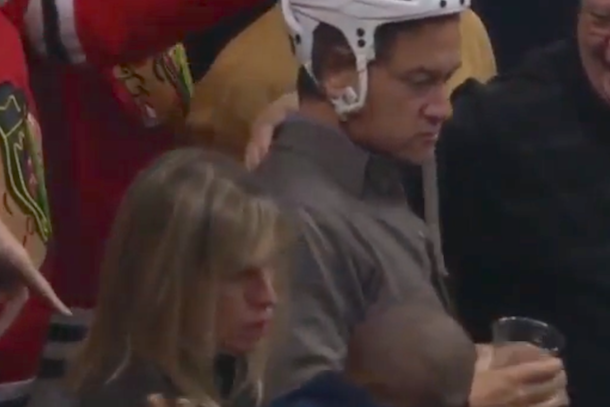 The not-so-funny part was when the helmet thief’s female companion dumped her beer all over Pardy. Why? Well, she seems pissed about something. Maybe she’s not a hockey fan and she didn’t realize that Pardy didn’t really get checked through the glass on purpose. Or maybe she thought the beer shower would be refreshing. Who knows? All we really know is that she is way too old to have that little class. Congratulations, lady. You’ve humiliated yourself in front of the entire internet. And wasted a $13 beer.